"(I liked my coaches) Because they pay attention to each of us and work with us through any struggles." "Our coaches at EVA are awesome and they see great potential in each player and try their best to make everyone shine in a certain way. Something I loved about my practices was how, at the end, we would wait for each other to cheer and how sometimes we took a selfie with Coach Vinnie." "Very nice and taught very well and made practice fun. Marion makes you feel like a better player because she gets more excited than you when you master a new skill." "Coach Mark was incredibly supportive of us and provided us with good tips to stay positive during some tough games." "Coach Mark never gave up on us. We collectively made some bad passes, sets, and hits that we wish we hadn't. Yet, he continued to coach us with the same confidence in us no matter what." "(Positional) practices were very informational and made us work hard. I personally enjoyed these practices more as I loved working with my team." "Elevation was one of best volleyball organizations I could have joined. I not only walked away with more knowledge and love for volleyball, but I left with new friendships and teammates that I have continued to stay in touch with." "They never got mad and angry. They would help when I need it and taught me a lot." "Elevation Volleyball has offered my daughter a positive, affirming, yet challenging opportunity to grow as an athlete. We already can't wait for the fall." 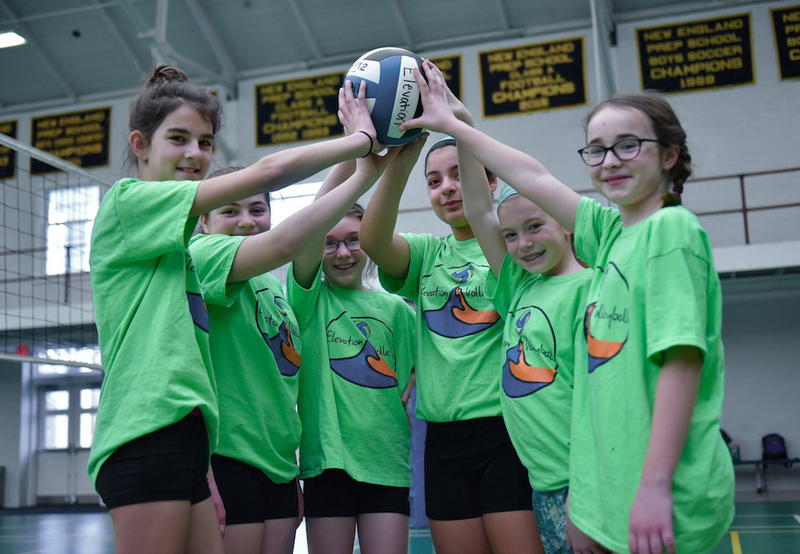 "(The coaches) all had great comments and corrections for my daughter and made it about the game of volleyball and not just winning"
"We really love it at EVA. My daughter being a left handed server was able to get the instruction she needed. The coaches were all great, made the practices fun and promoted a team spirit. The ability to practice with all ages was helpful for my daughter because direction from her peers was important and she enjoyed it!" "Small group instruction and very positive coaching were huge pros. Marion was excellent and Jackie did a good job as assistant. And everyone just loves Vinnie, how could you not?" "Coaches were extremely knowledgeable and supportive at EVA. My daughter wasn't sure what to expect at first, but she made great friends and her skills grew tremendously!" "EVA was a great choice for our daughter. The coaches were extremely supportive. Time in practices was spent ensuring that the teammates bonded and had fun, while also greatly improving their skills and understanding of the game." "Just all around great young women role models and helped to develop young girls into better players and teammates." "Coach T is an outstanding coach and Alyssa loved playing for her. All the playing time provided great opportunity to strengthen skills." "Coach T- the coach who pushed me to become a better player and person. She pushed me when I didn't think I had any more left in me. Not only was she open-minded, but always willing to work on things with me. One of the best coaches I've ever worked with." "The coaches are super fun to be around and make practices exciting. They are always helping to improve your game and give tips and advice to help you. They are good at cheering us up in multiple different ways and are good to help you out of your comfort zone and get you to try different positions and techniques." "I absolutely loved EVA. Everybody was so sweet, and I've definitely made some new friends that I will keep forever. We treat each other like family, because we are one. It definitely changed my life, and I can't wait to come back and play next year." "Overall, I loved playing volleyball for Elevation. It was a great first experience playing for a club team. Our coaches and team made an incredible bond. Throughout the season, I learned so much not just about volleyball but about life. I was taught to play with everything I can and leave my heart on the court. I am so sad the season has come to an end but I cant wait for next season." "I feel she made a great group of new friends while learning a tremendous amount about the game. In addition, the coaches were fantastic. Very motivating and always encouraged the girls during practice as well as tournaments." "(Coaches) were always positive. They had confidence in all the girls and throughout the tournament season there was constant encouragement. Never put the girls down even if someone made a mistake." "Elevation provided a very encouraging, very positive introduction to club volleyball for my daughter. Our coaches made practice fun, and the girls got along great. My daughter was always excited to go to practice." "My daughter's experience at Elevation Volleyball Academy was very good. It was her first year playing for a club and this was a great way to start. Elevation provided a comfortable learning experience where my daughter was able to better her skills. The bond she created with her teammates and the whole club was truly incredible. Cannot wait for next season!!"